In any class you sign up for, you will learn some of the same basic information: what are the stages of labor, what is a contraction, common interventions, when to call your care provider, etc. The differences are in the basic philosophy of the class. 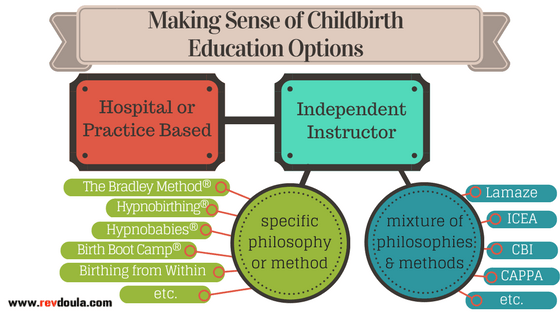 Your first choice is between taking a class offered by a your hospital or care provider, or choosing an independent childbirth education class. Hospital/care provider classes tend to be focused on helping you be a good patient of that hospital or practice, which can be great if you feel very confident that your hospital or care provider has your best interests in mind. For example, women who plan to deliver at a particular birth center may find that the class they offer in-house helps them to know what to expect in that environment and with those caregivers. Another advantage of this type of class is that the cost tends to be much more affordable than an independent class, since the cost of the class is often heavily subsidized by the hospital or practice. However, many birthing couples choose to pay a higher price to take an independent class, since the instructors of these classes can freely discuss options in birth without pressure from their employers. For example, a group of OBs or hospital administrators may not want mothers to deliver their babies in any position other than flat on their backs, and so they would not allow an educator in their employ to include information on upright pushing positions. If you want to be sure that you are educated on all of the options available to you, you may want to look into taking an independent class. But once you choose to go outside the system, so to speak, that’s when things get really confusing. There are so.many.choices. How to decide which class is right for you? Which Birth Philosophy or Class is Right for You? Independent classes can be subdivided into two groups: classes adhering to a specific philosophy of birth and employing methods that correlate to that philosophy, and classes that are more of a mash-up of methods. In the specific philosophy camp are: Hypnobirthing®, Hypnobabies®, The Bradley Method®, Birthing From Within, Birth Boot Camp®, and many others, though the ones I’ve listed seem to be the most popular options going. Again, all of these will include some information on common interventions in birth, but they all share the goal of helping mothers avoid intervention in general, and pain medication in particular. An exception to this may be Birthing From Within, as it emphasizes acceptance of what comes, more than focusing on a specific (unmedicated) outcome as best. Hypnobirthing® and Hypnobabies® share a lot in common. They both use guided relaxation scripts and self-hypnosis techniques as a means of coping in labor. Hypnobirthing® has been around longer, and there are more instructors out there teaching in-person classes. Hypnobabies® is newer, so it may be more difficult to find an instructor in your area. Hypnobabies® does offer a home-study course, while Hypnobirthing® does not, though it is possible to buy a book on Hypnobirthing® to read on your own. The Bradley Method® has the subtitle “of Husband-Coached Natural Childbirth,” which gives you a good idea of what this method emphasizes. Bradley Method classes focus on keeping mothers low risk, and on the partner taking a very active role in helping her stay relaxed, and thus able to cope with the intensity of labor and achieve a low intervention, unmedicated birth. Important to note: Bradley classes are required to be 12 weeks long, so if you are interested in this philosophy, sign up early. Birthing From Within takes a different view of the role of partners—rather than helping them to become birth coaches, they view partners as “birth guardians or loving partners.” The role of the instructor in Birthing From Within classes is that of mentor, guiding the parents in their own self-discovery. Above all, Birthing From Within sees birth as a rite of passage, which, regardless of birth outcome, can be an occasion to practice awareness. I once had a birth client asking me for help in choosing a class tell me, “You should know that creating birth art is more terrifying to my husband and me than the prospect of the birth itself.” I steered her very firmly away from Birthing From Within. Birth Boot Camp® uses a unique frame for their classes. They use a militaristic theme throughout their materials, and their tagline is “Training Couples in Natural Birth.” The military theme is clever packaging for some really serious preparation for giving birth naturally and for breastfeeding. This course is 10 weeks long, so be sure to sign up early if this philosophy speaks to you. They also have an online version of the course, for those who don’t have an instructor in their area. Again, these are the main options for classes promoting a specific philosophy in birth, though there are others out there (probably someone wrote a new one while I was typing this). The other class options are those that use a mixture of methods and philosophies. These vary widely, because the instructor of the class often writes her own curriculum, or at least she adapts a model to suit her own experience and preferences. The class may include a guided relaxation script and/or an exercise in releasing fears, or it may not—it all depends on the instructor. Often these classes will not focus so determinedly on achieving a low intervention birth, but will guide the parents in evaluating the risks/benefits of each intervention and encourage the parents to advocate for themselves in making the choices that are right for them. There are loads of training and certification programs out there—Lamaze*, ICEA, Childbirth International, CAPPA, and many others. I hope this post has helped you to cut the confusion and choose a class that will suit your preferences and help you prepare to meet your baby, whether it is through self-hypnosis or boot camp, the hospital class or mindfulness practice. Good luck! You can do it. *A note on Lamaze, since a lot of people think it is something it isn’t (or at least isn’t anymore): Lamaze has been around for a long time, and used to be known primarily for their breathing and relaxation techniques. But over the past 50 years, Lamaze has adapted its curriculum, dropped the emphasis on learning specific breathing techniques, and now focuses on helping parents have a safe and healthy birth through knowledge of their “Six Healthy Birth Practices.” Lamaze instructors can be found teaching both in hospitals and independently. This guest post was written by Stephanie Spitzer-Hanks. Stephanie gave birth to her first child in the Netherlands, where the nurturing and encouragement she received from so many women there inspired her to become a doula. Now she strives to give unconditional support and evidence-based education to families so that they can be confident in making the choices that are right for them. She is an ICEA certified childbirth educator, an Evidence Based Birth® Instructor, a DONA certified birth and postpartum doula, a StillBirthday certified bereavement doula, and a certified lactation counselor through Healthy Children’s Center for Breastfeeding. On the side of all of that, Stephanie is an ordained minister in the United Church of Christ, and she serves as a chaplain at a hospital and writes and speaks about birtheology when she gets the chance. You can find out what she is up to at www.revdoula.com.